The principal events in the Association’s calendar are the Annual Congress, the General Assembly and the meetings of the Board. An additional meeting of the Board is generally held early in the new financial year, either in Paris or at another location, see Statutes Article 6.5. The General Assembly takes place at the time of, and in the same location as, the Annual Congress, and is prepared for at a meeting of the Board, immediately beforehand, see Articles II, III and X, below and Statutes Articles 5-6 and 16. Proposals for the timing and location of the Annual Congress and General Assembly are submitted to the Secretary-General, in the first instance and by the Secretary-General to the Board, for evaluation, see Article III.6, below. They are then submitted by the Secretary-General to the General Assembly, together with the Board’s recommendations, for a decision, but see Statutes Article 5.7-8 re Extraordinary General Assemblies. II.1 Members, International Honorary Members and National Honorary Members who are not up to date with their subscriptions may take part in the General Assembly, but are not allowed to vote, seeStatutes Articles 5.2-3, 5.5 and 15.1-2. II.2 The General Assembly is presided over by the President of AICA or, in her or his absence, by either the Secretary-General or a Vice-President both designated by the Board, see Statutes Article 8.3. Its sessions are organised by the Secretary-General. In an emergency, the Secretariat is entitled to take decisions on behalf of the General Assembly between meetings of the Board and the General Assembly, but is required, in all such cases, to account for its actions at the next meeting of the Boardand/or General Assembly. II.3 The language(s) of the Host Section(s) may be used in addition to the three working languages of AICA, English, French and Spanish, see Article III.5, below and Statutes Articles 4.7 and 19.4-5. .
II.4 Any proposed changes or additions to the draft agenda must be submitted, in writing, to the Secretary-General no later than two weeks before the start of the proceedings, see Statutes Article5.10. Decisions on items not included in the agenda may only be taken in exceptional circumstances, at the discretion of the President, and with the supports of the other members of the Secretariat. II.5 Any resolutions, motions or amendments must be submitted to the Secretary-General on the day prior to that on which the proceedings are due to be held. The President reserves the right to waive this requirement, with the support of the other members of the Secretariat, but will only do so in exceptional circumstances. II.6 The General Assembly elects, first the Vice-Presidents, then the International Board Members and appoints Chairs of Committees in order to maximise the chances of ensuring that the Board is always composed of members from a wide diversity of countries and geographical regions, see Articles IV andXIV, below. II.7 Proxy voting is not allowed in the General Assembly. II.8 There are no quorum rules for the General Assembly. 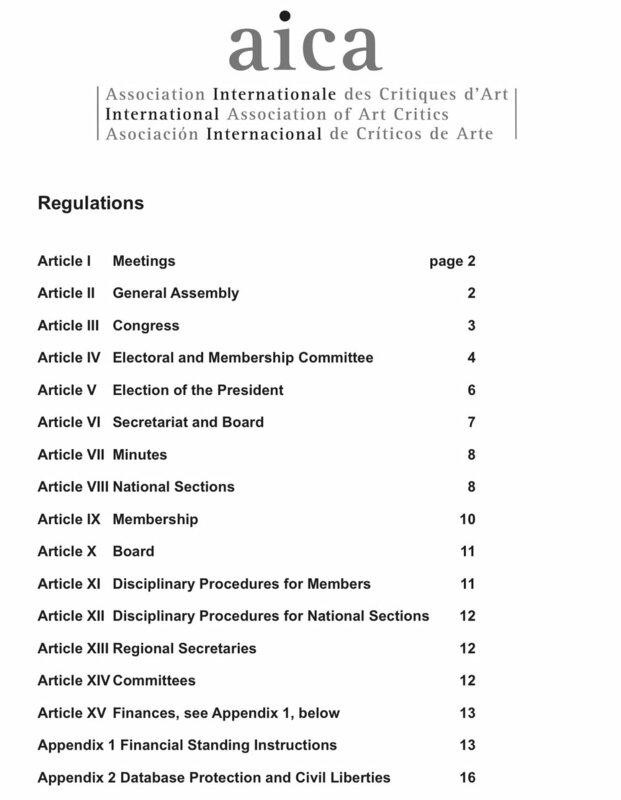 III.1 With the assistance of the National Sections AICA organises an annual Congress, whose purpose it is to study current professional, aesthetic and other issues of art criticism within the broader historical, social and political context, see Statutes Article 16. Working with the AICA Congress Committee, Host Sections are encouraged to include guest lecturers with widespread recognition for their achievements in a relevant field of expertise. Host Sections are also encouraged to invite leading personalities and professional colleagues from the locality, or region to attend the opening and closing sessions of the Congress and other relevant events, see Article XIV.4, below. III.2 Host Sections are encouraged to HM See comments in provious paragraph!] CC “The Host Sections are encouraged” to distribute information about the Congress in local, national and international media and to invite local artists, other art professionals and students to attend keynote lectures, round tables and relevant social functions. They may set a local scale of charges for outsiders wishing to attend the whole, or a part, of the proceedings. III.3 Host Sections are responsible for making all on-the-spot arrangements for the Congress and the meetings of the General Assembly, the Board, the Committees and the President’s Advisory Group, if any, and for all attendant costs. Sections may levy such fees as are deemed necessary. National Sections organising Congress still need to pay their annual fees to AICA International, as usual. III.4 Host Sections are responsible for obtaining the grants and subsidies necessary for the organisation of meetings. The AICA Secretariat assumes responsibility only for the office expenses in Paris incurred for the organisation of the General Assembly, the Board meeting, the meetings of the Committees and the President’s Advisory Group, if any. See Appendix 1, paragraphs 1.1 and 6.4, below. III.6 Host Sections are expected to work with AICA’s Congress Committee which should include members from Host Sections, to agree the theme, selection of speakers and the Congress programme, see Article XIV.3-4, below. An outline proposal, adequate for funding applications, must be submitted to the Board, through the Secretary-General, at the time of the previous year’s General Assembly. This outline programme should include the proposed theme, dates, location and budget of the Congress, together with an indication of possible keynote speakers and a schedule for a call for papers. The draft budget should indicate how the Host plans to cover the costs. Host Sections are then required ost Sectins areHHH CC: Host Sections are then required” to submit the final programme to the Secretary-General, for endorsement by the Secretariat and the Board at the time of the annual February/March Board meeting. A different timetable has to be established with the Secretariat, well in advance, if a Congress is held in the first six months of the calendar year, see Article I, above. III.7 The Secretary-General provides Host Sections with a Rough Guide to the Organisation of an AICA Congress, also available on the website at http://aicainternational.org/en/guide-to-the-organisation-of-the-congresses/ and any other information that might be of use to local organisers, including access to information on the Association’s database. III.8 The AICA Office or Host Section sends out up-to-date information about the Congress to all members with access to email and, likewise, a reminder as soon as the full programme and accompanying information become available. Any information about the Congress should be published on the website as soon as it is available. A new reminder with all Congress information should be sent to all individual members closer to the Congress. III.9 No invited speaker or member may be excluded from taking part in the proceedings on the basis of their political views, ethnic origin or personal beliefs, or, within the time available, prevented from taking part in a full and open discussion of the issues on the agenda for the Congress. Issues of language, nationality, gender or sexual orientation may not be a cause for excluding individuals from participating, as speakers or members. It is the responsibility of the Host Sections to ensure that the lobbying of members by political parties or individuals or groups representing sectarian interests does not occur at, or interfere with, the proceedings of the Congress. IV.1 The Electoral and Membership Committee is appointed by the General Assembly, on the recommendation of the Board, for a term of three years, renewable once only with or without a break in between. The terms of office of the Chair and the membership of the Electoral and Membership Committee are three years for each position as either Chair or member, renewable once only, seeArticles VI.1, below. All members of the Board, with or without voting rights, are eligible to serve on the Electoral and Membership Committee and to propose their own candidature to the Secretary-General, in the first instance. A member who leaves the Board may still serve on the Electoral and Membership Committee until the end of her or his three-year term, but in this case the term is not renewable. IV.2 The Electoral and Membership Committee comprises a minimum of six members and is broadly representative of the different geographical regions determined by the General Assembly. It includes at least one native speaker of each of the three working languages of the Association. If there are not enough members of the Electoral and Membership Committee present at a meeting, the Committee and the Board may appoint members of the Board to join the Committee ad hoc. IV.3 The Electoral and Membership Committee makes recommendations to the Board and the General Assembly on all technical or legal matters relating to the adherence of National Sections, of the Open Section and of individual Members, see Statutes Articles 2, 4.5-6, 5.4-5, 5.6r, 5.6t, 6.4k and 6.4l. IV.4 The Electoral and Membership Committee advises the Board, in writing, on the eligibility of National Sections for membership of the Association, see Article VIII.1, below and Statutes Article 5.6t. IV.5 The Electoral and Membership Committee advises the Board and the General Assembly on all matters relating to the interpretation and revision of the Association’s Statutes and Regulations. From time to time, this Committee will also monitor these Statutes and Regulations, see Statutes Articles 18.1 and 19. IV.6 The Statutes and optional Regulations of the National Sections and of the Open Section, and any changes to these documents, are subject to approval by the General Assembly, on the recommendation of the Electoral and Membership Committee. The Committee may monitor these Statutes and optional Regulations, to ensure that they are not in conflict with the International Statutes and Regulations, and that core requirements, such as the standard conditions for eligibility for membership and renewal of the National Boards have been observed, see Article VIII, below. IV.7 At the time of the General Assembly, the Chair of the Electoral and Membership Committee holds available for consultation a list of all newly accepted members and all candidates for membership, whose applications have been refused. The names on this list must be presented either en bloc or read out individually, for adoption by majority vote. The Assembly’s endorsement may not be withheld, other than for reasons which are legal or procedural, see Article IV.8, below and Statutes Article 2. IV.8 The Electoral and Membership Committee presents a carefully argued report, in support of any recommendation of its own to turn down an individual candidate’s application for membership of the Association. In instances where legal or procedural grounds are at issue, the General Assembly may exercise its prerogative to question or overrule the Electoral and Membership Committee’s individual recommendations. IV.9 The Electoral and Membership Committee is responsible for counting and determining the validity of all votes cast by a show of hands and of all votes, with the envelopes, if any, cast by secret ballot at the General Assembly and at meetings of the Board, see Article VII.2, below and Statutes Article 5.3. IV.10 The members of the Electoral and Membership Committee are charged with presenting a written report of the voting process. This report, and any ballot forms that may have been used, are held available on file for consultation by members of the Committee, in the event of any complaint about electoral procedures or demand for a recount of the votes cast, see Article V.10, below. The Electoral and Membership Committee’s reports on the elections and of the endorsement or rejection of applications for membership should be attached to the minutes of the General Assembly. V.1 The Secretary-General must inform all the Presidents of the National Sections and all members of the Board about the call for candidates for the Presidency not later than four months before the General Assembly at which the elections are to be held. The identical information shall also be posted on the members’ section of the AICA website. Candidatures for the Presidency of the Association, including candidatures from members of the Open Section, must be submitted to the Secretary-General by the President of one of the National Sections, with copies to the Chair of the Electoral and Membership Committee and to the AICA Office not later than three months before the General Assembly, see Statutes Article 8.1. A President wishing to present her or his candidature for a second term of office must likewise communicate her or his decision to the Secretary-General, with copies to the Chair of the Electoral and Membership Committee and to the AICA Office by the same date. All candidatures must be acknowledged on receipt. V.2 The Secretary-General should communicate the names, CVs and programmes of individual candidates to the Presidents of the Sections and to all individual AICA members with access to email, together with the voting instructions, in a single, consolidated email no less than two months before the General Assembly. The identical information must also be posted on the members’ section of the AICA website, at the same time. If there is no candidate for the Presidency three months before the General Assembly, the Secretary-General must inform all the Presidents of the National Sections and all members of the Board about a second call for candidatures for the Presidency of the Association, including candidatures from members of the Open Section, which must be submitted to the Secretary-General by the President of one of the National Sections, with copies to the Chair of the Electoral and Membership Committee and to the AICA Office not later than two months before the General Assembly. The identical information must also be posted on the members’ section of the AICA website. V.3 The Secretary-General communicates the names, CVs and programmes of individual candidates to the Presidents of the Sections and to all individual AICA members with access to email, together with the voting instructions, in a single, consolidated email no less than 45 days before the General Assembly. The identical information must also be posted on the Members’ section of the AICA website, at the same time. If no candidate is available this way, the Presidential election should be postponed to a subsequent General Assembly or a specially convened Extraordinary General Assembly. All information, including instructions and the candidates’ programmes and CVs should be edited in the three working languages of AICA, English, French and Spanish, see Statutes Article 4.7. V.4 Postal votes are only admissible for the election of the President, for any proposal to transfer AICA’s headquarters to a different city, or to dissolve the Association, see Statutes Article 4.8-9. V.5 Each voter should complete three voting slips with one mark only: Yes, No or Abstain and place them in separate sealed envelopes numbered 1, 2 and 3 to indicate the round in which they should be opened. No other sign of identification should be visible on the envelopes or the vote will be declared invalid. The three envelopes, containing one voting slip each, should be inserted in another envelope, on which is indicated the name of the voter and the National Section or Open Section. If this information is also presented in a separate list, or is missing, the vote should be declared invalid. V.6 In case there are only three candidates, the same procedure should be followed with each voter completing two voting slips. If there is just one or two candidates only one voting slip should be completed placed in a sealed unnumbered envelope, which is placed inside another envelope with the name of the voter and the National Section or Open Section. V.7 Each voter sends their vote, either through the President of the National Section or, for members of the Open Section, to the Secretary-General. Electronic and faxed votes are not accepted. Individual members may send votes by registered letter to the AICA Office to arrive at least one week before Congress opens. Paid-up members attending the General Assembly may personally deposit their voting slips in the ballot box or hand to the Secretary-General or the Chair of the Electoral and Membership Committee if they have to leave early. These will take the place of any earlier postal vote they have made. V.8 The Presidents of the National Sections deposit these votes with the Secretary-General, either by a registered letter or in person at the beginning of the Congress. The Secretary-General gives both these votes and the votes s/he has received from the Open Section to the Chair of the Electoral and Membership Committee, which is responsible for verifying their validity, including checking that members who are voting are paid-up for the current year. V.9 After the outer envelope is removed to preclude identification of the voter, the envelopes containing the ballots are opened in numbered order, for each respective round of voting. All ballot papers are retained for archiving. In the first round any candidate receiving an absolute majority of votes cast, including No votes and Abstentions, will automatically be elected. Invalid votes are not included in the vote count but are incorporated in the report from the elections. If no single candidate emerges at this stage, the three candidates winning the highest number of votes will then pass to the second round. Any candidate receiving an absolute majority of votes cast will likewise automatically be elected. If no single candidate emerges at this stage, the two candidates winning the highest number of votes will then pass to the third round. The candidate receiving the higher number of votes will be elected President of the Association. The voting slips for candidates already eliminated will be treated as blank in each round and not be taken into account in assessing the number of votes cast. If there is a tie among the candidates, the candidate with votes from most Sections is the winner. If this ballot also results in a draw, lots must be drawn for the winner. V.10 All envelopes and ballot papers, including those which are invalid and have been declared null,must be archived, with the report on the voting process by the Electoral and Membership Committee, by the AICA Office until after the General Assembly two years later and made available to members of the Electoral and Membership Committee, on request see Article IV.10, above. V.11 Outgoing Presidents may be elected Honorary Presidents at the General Assembly, if approved by a two-thirds majority in a secret ballot. Nominations for election to the position of Honorary President must be proposed and seconded by two members of the Board, with or without voting rights, see Statutes Article 3.1. V.12 The post of Honorary President, without voting rights for the Board, is a life-long appointment. Holders of this title are offered an AICA card and annual sticker, free of charge, from the AICA Office and the cost recorded in the Association’s accounts, see Statutes Article 3.6. VI.1 The elections of the President, Secretary-General and Treasurer and the appointment of their optional Deputies take place at the relevant Annual General Assembly. The three year term of the new President begins from the moment of her or his election by the Assembly and runs until the time of fresh elections at the Assembly, three years later, irrespective of the Assembly taking place in the first or second part of the year, see Statutes Article 8.8. The four year terms of the Secretary-General and Treasurer and their optional Deputies begin on the first of January, in the year following their election and run for a period of four full calendar years, see Statutes Articles 9.3-4 and 10.3-4.The three year terms of the Vice-Presidents and Regional Secretaries, if any, begin from the moment of their election by the General Assembly and run until the time of fresh elections at the Assembly, three years later, irrespective of the Assembly taking place in the first or second part of the year, see Statutes Article 11.1. The term of Chairs of Committees is usually three years, renewable once only with or without a break in between and begin from the moment of their appointment by the General Assembly and run until the time of fresh appointments at the Assembly, three years later, irrespective of the Assembly taking place in the first or second part of the year, see Articles IV.1, above, XIV.3, below and the exception XIV.4, below and Statutes Article 14.1. The one-year term of an International Board member begins from the moment of their election by the General Assembly and runs until the time of fresh elections at the Assembly one year later, irrespective of the Assembly taking place in the first or second part of the year, see Statutes Article 12. VI.2 If a Secretary-General or Treasurer steps down before the end of their term, their respective Deputy replaces them for the remainder of the period, unless the Board or the General Assembly decides to hold fresh elections at the next General Assembly. If the Secretary-General or the Treasurer prematurely steps down and there is no appointed Deputy Secretary-General or Deputy Treasurer the Board can appoint an Acting Secretary-General or Acting Treasurer until fresh elections can be held. Between the meetings of the Board, the Secretariat has the right to appoint an Acting Deputy Secretary-General or Acting Deputy Treasurer, after receiving written support from a majority of the members of the President’s Advisory Group, see Statutes Article 8.7, if any, in response to an email ballot, or, failing that, after receiving written support from a majority of the Vice-Presidents, in response to an email ballot. The term of the Acting Secretary-General or Acting Treasurer appointed in this way runs until the next Board meeting and is renewable until the elections at the following General Assembly. VII.1 The President and the Secretary-General have the responsibility for ensuring that accurate records are kept of every meeting of the General Assembly, the Board and of all Committees. All minutes are posted on the members’ section of the AICA website, as soon as practicable, with a clear indication of whether the minutes are in draft form or in the final version approved by the General Assembly, by the Board or by relevant Committees, see Statutes Articles 5.6a and 6.4a. VII.2 The minutes of the Board, General Assembly and all Committees must be voted on, and approved, at the next relevant meeting, see Article XIV.6, below and Statutes Articles 5.6a and 6.4a. At the beginning of every meeting of the General Assembly and the Board two members of the Board are appointed by the Chair of the Electoral and Membership Committee to keep a tally of any voting by a show of hands, see Article IV.9, above. VIII.1 National Sections are required to have their own National Statutes and optional Regulations, which conform as closely as practicable to the current versions of the Association’s International Statutes and Regulations. The Electoral and Membership Committee must approve them, for subsequent endorsement by the General Assembly. Any subsequent changes must immediately be communicated to the Electoral and Membership Committee and, subsequently, to the General Assembly, for approval, see Article IV.3-6, above and Statutes Articles 5.6t and 6.4l. a) set up a Board, of current members of the Section consisting of, at the minimum, a President, a Secretary and a Treasurer, whose roles broadly correspond to those of the office-holders, at international level. The Treasurer’s duties may, if necessary, be combined with those of the Secretary or the President. b) meet at least once a year and record all decisions and discussions. c) keep the Secretary-General regularly informed of their activities and send her or him an annual list of new members, presented by the President, accompanied by a completed AICA International Biographical Form for each new member. Sections must maintain up-to-date details of their members’ email addresses and other relevant contact details, to assist the AICA Office with maintaining up-to-date records. d) ensure prompt payment to the AICA Office of all outstanding membership fees, in accordance with the Treasurer’s standing instructions for payment into the Association’s euro or US dollar accounts. Payment must be net of all bank charges and commission, see Appendix 1, paragraph 3.9, below. e) submit a list of all members with contact details, indicating who is paid-up, to the Secretary-General and Treasurer one month in advance of the General Assembly, see Article VIII.4-5, below. f) submit to the Secretary-General an annual report on the activities of the Section, including information about the members of the National Board, for posting on the members’ section of the Association’s website, one month before the General Assembly. VIII.3 A new National Section should have a minimum of five members at the outset. VIII.4 Subscriptions of National Sections and members of the Open Section should be paid in a single payment to the Association’s euro, or US dollar account, by the end of February at the latest. All payments in the Euro Zone must be made in euros; elsewhere, payments may be in euros or, exceptionally, in the US dollar equivalent of euros. Only in exceptional circumstances can payment be made in more than one payment and then only with the prior agreement of the Treasurer. Payments must be net of all bank charges and commissions on currency exchange. A list of all members, with their contact details and indicating who is paid-up or not, should be sent one month in advance of the General Assembly to the Treasurer, with copies to the Secretary-General and the AICA Office. This list provides a record of eligible voters at the General Assembly. VIII.5 Towards the end of the calendar year, the Treasurers of the National Sections must reconcile their members’ subscriptions, checking stickers and replacement cards issued against payments received. They should send the AICA Office a copy of this reconciliation of accounts, together with the balance of fees not collected earlier in the year, unused stickers for the current year and an updated list and contacts of all members, paid-up and not. The stickers’ Order Form must be completed on the AICA website by 30 November to enable mailing to National Sections to distribute stickers to their members by the end of the year. Please note that email requests will not have priority. VIII.6 Members of the Open Section should pay their annual subscriptions to the Association’s euro or US dollar account and send updated contact information to the AICA Office by the end of February, at the latest, at the standard rate. Members of the Open Section who experience genuine difficulty may be permitted to pay later, with the prior agreement of the Treasurer. IX.1 Membership of a particular Section is primarily determined by the individual’s place of residence, or principal area of professional activity, rather than their nationality. They may apply to join the Section of the country where they have been professionally active for at least one year, or the Open Section, see Statutes Article 2.1. No individual may join more than one Section. IX.2 Proposals for membership, accompanied by a completed AICA International Biographical Form, downloadable at the website and supporting evidence of three years’ involvement in at least one of the activities listed in Article 2.1 of the Statutes, must first be submitted to the President of one of the National Sections or to the AICA Office in the case of the Open Section, see Article IV.3, above and Statutes Article 2.3. IX.3 All candidatures approved by the National Sections or, in the case of the Open Section, by the Secretariat, automatically qualify for provisional membership, see Statutes Article 2.4. Full membership is conferred on successful applicants, once their International Biographical Forms have been transmitted to the Electoral and Membership Committee via the AICA Office, for information and approval and endorsed by the General Assembly. Endorsement is automatic, in all cases where the conditions laid down in the Statutes have been carefully observed and the correct procedures followed. IX.4 The AICA Office registers the contact details of the newly elected members and informs National Presidents of the acceptance or refusal of candidates for membership of the Association, along with the reason for any refusal(s). The AICA Office informs individual applicants to the Open Section directly of the outcome of their application, see Statutes Article 2.14. IX.5 Candidates elected to a National Section or the Open Section the same year but after the date on which the General Assembly is held will automatically qualify for provisional membership of AICA up to the end of the current financial year. Their provisional membership will be renewed for a further full year, provided they pay that year’s subscription fee. Their membership of the International Association will then be formally ratified, or rejected at that year’s General Assembly. In case of rejection, they may still make use of their card and sticker, up to the end of the year for which they have paid their subscription, but must then return both to the President of their Section, for cancellation and disposal, see Statutes Article 2.4 and 2.15. IX.6 Fully documented individual applications from Sections whose new Statutes have not yet been formally approved for compatibility with those of the International Association, and from new Sections in the process of being formed, must first be submitted to the Electoral and Membership Committeefor approval, before they are presented to the General Assembly, with the Committee’s recommendations for endorsement or rejection. The documents required, in such cases, comprise the completed AICA International Biographical Form, a separate CV and copies of a selection of the applicant’s texts and other relevant documents. After the General Assembly, the Presidents of the National Sections whose Statutes are in the process of being checked will be informed of the outcome, in writing, by the AICA Office, acting on the instructions of the Electoral and Membership Committee. IX.7 New members are required to start paying annual subscriptions, via the Section to which they have been elected, from the beginning of the calendar year following that in which their election has been formally endorsed by the General Assembly. New members of the Open Section are required to start paying annual subscriptions from the beginning of the calendar year following that in which their election has been endorsed by the General Assembly direct into the Association’s euro or US dollar bank account, net of all bank charges and commissions on currency exchanges, see Statutes Article 2.11. IX.8 Members wishing to transfer from one Section to another must first apply for acceptance by the new Section in question, which will submit the AICA International Biographical Form of a successful applicant to the Electoral and Membership Committee, via the AICA Office, for endorsement by the General Assembly. The same procedure for applications to the Open Section will be followed, see Articles IX.1-5 and IX.7, above, XII.3, below and Statutes Articles 2.1 and 4.6. X.1 The Board comprises the Secretariat: President, the Secretary-General, the Treasurer, the Deputy Treasurer, and their Deputies, if any; the Presidents of the National Sections, the nine Vice-Presidents, the Regional Secretaries, if any, the ten International Board Members, the Chairs of Committees established by the General Assembly, with voting rights in all matters; the representative of the Archives in Rennes with voting rights in matters concerning the Archives only; the Honorary Presidents, former International Presidents, International Honorary Members, former Secretaries-General and Treasurers and former Vice-Presidents, without voting rights, see Statutes Article 6.1. X.2 The Vice-Presidents and the International Board Members are all expected to assume one or more specific responsibilities. Such activities may include membership of a Committee, and help with translating, or proofreading draft minutes and official documents for the AICA International website, see Statutes Article 11.5. X.3 Proxy voting is not allowed in the Board with the exception of Presidents of National Sections’ nominated representatives, see Statutes Article 6.6. Each member present at the Board with voting rights has only one vote, with the exception of the Chair of the Board meeting, in the case of a tie break in an election by show of hands, see Statutes Article 15.1. In an election by secret ballots the tie is settled by drawing lots, unless there is provision for a second round of voting in the election of Presidents or Vice-Presidents. X.4 In the event that a duly planned meeting turns out to be inquorate, the President may still proceed to hold the meeting, at her or his discretion. However, no decisions taken at such a meeting will be deemed valid, unless a full quarter of eligible voters, less those present or represented at the meeting, signal their assent, in writing by email or letter, within sixty days of the meeting being held, see Statutes Article 6.5. XI.1 Under Statutes Article 6.4j, the Board is responsible for discipline, arbitration and conciliation. The Board exercises these duties, in cases where there has been a breach of the Statutes or the Regulations, or acting on a decision by the General Assembly. The Board may consider the activities of a member of the Association to be in conflict with the professional dignity or the common interests of the membership. It may act ex officio, or on a complaint. However, no sanction may be imposed without allowing the member concerned to present her or his case. The member concerned may choose to do this in writing or in person. In the latter instance, they are entitled to ask to be accompanied by anyone they consider helpful or supportive to their cause. An offending member may be expelled, if the General Assembly resolves that the gravity of the deed warrants such a measure. Alternatively, they may be formally reprimanded, warned or censured, see Statutes Articles 2.12c and 5.6s. XI.2 The Board may be called on to arbitrate, at the request of any parties concerned, in the event of a dispute between two or more members or between one or more members and a third party. XII.1 The Board exercises the same duties and obligations as in Article XI, above, in relation to National Sections which are in breach of the Statutes or Regulations, for reasons of serious misconduct, or in consequence of a decision of the General Assembly. A National Section which is under investigation, on suspicion of a serious misdemeanour may be temporarily suspended, by decision of the Board. Before this happens, the Section, or its official nominee, will be given the opportunity of answering the written charge(s) laid before it by the Board within a period of three months, after which the matter will be either dropped, possibly to the accompaniment of a formal reprieve, reprimand or warning from the Board, or referred to the next General Assembly, during which period the temporary suspension may remain in force. XII.2 Sections which fail to pay their annual fees for two years in succession will be formally notified by the Secretariat, on two separate occasions, with an interval of at least one calendar month between each occasion, that they run the risk of suspension and eventual expulsion from the Association, if they fail to catch up with their payments, in arrears, by a specific date, see Statutes Article 2.12. Sections experiencing genuine difficulties with their payments, owing to causes beyond their control, such as hyperinflation, currency restrictions or civil commotion, are under an obligation to negotiate with the Treasurer a solution to their temporary difficulties, if they are not likewise to risk suspension or expulsion from the Association, see Appendix 1, paragraph 3.9, below. XII.3 Individual members of Sections which have been suspended or expelled from the Association are encouraged by the Secretariat to contact the Secretary-General, with a view to applying to join either the Open Section or the Section of a neighbouring country, pending the re-establishment of their own National Section. Regional Secretaries, if any, must submit reports every three months to the Secretary-General, see Statutes Article 13. XIV.1 Committees may be formed by the General Assembly, on the recommendation of the Board or the Secretariat, to perform tasks that the Board has decided to undertake. XIV.2 These Committees may be either permanent, or temporary. Work for these Committees is performed on a voluntary basis. Temporary Committees may be set up for individual projects and undertakings, including seminars, colloquia, surveys and research. XIV.3 The Chairs and the members of these Committees are customarily chosen from among the members of the Board, with or without voting rights. The terms of office of Chairs and the membership of Committees are determined by the needs of their mandates and may be reviewed and amended, if necessary, by the Board and the General Assembly, see Articles IV, VI.1, above and XIV.4, below and Statutes Article 14.1. XIV.4 The Chair and membership of the Congress Committee is reviewed each year and may change to represent the host Section and to meet the logistical and language requirements for Congress in that year, see Articles III.1 and XIV.3, above. XIV.5 The President of AICA is an ex officio member of all Committees established by the General Assembly, see Statutes Article 8.3. XIV.6 The Committees are required to report at regular intervals to the Board, and then to the General Assembly; their draft and final minutes and reports are published on the members’ section of the AICA website, see Article VII, above. XIV.7 The Committees may offer suggestions, propose work programmes and make formal recommendations, but may not take any decision concerning the ethical or financial responsibility of AICA without the approval of the Secretariat. The Association’s financial year is 1 January to 31 December. The President oversees the expenses of the Association. The Treasurer is the Trustee of the Association’s finances. S/he controls the financial situation of the Association, see Statutes Articles 8.6, 9.2 and 10.2. 1.1 The funds are reserved solely for the administration of the Association, including salaries and statutory benefits of the employees; office rental and running costs; the website, communications and publications; special projects and activities, including contributions, if any, to the organisation of the Annual Congress; and assistance, exceptionally and when possible, via the Fellowship Fund, for members’ fees and travel to meetings organised by the Association, see Article III.4, above. 1.2 Travel and related expenses of the Secretariat and the Administrative Assistant(s), as well as other expenses and those of special events are determined by the Secretariat and approved by the Board either within the draft annual budget voted on by the General Assembly the previous year or by separate vote. 1.3 Unforeseen expenses exceeding ten per cent of the draft annual budget must be approved by a majority of the members with voting rights present at a Board meeting or by a majority of the total number of members with voting rights consulted by mail or email. 1.4 Grants received by the Association for specific projects and the Fellowship Fund, are listed under the main budget headings, but ring-fenced and accounted for separately. 2.1 The Secretariat makes all expenditure in accordance with the annual budget for the current year approved by the Board and the General Assembly the previous year. 2.2 At the beginning of the year, the external certified Accountants send the Treasurer audited accounts of the preceding year. The Treasurer prepares the Annual Financial Report which is scrutinized by the Finance Committee, see Statutes Article 14, before presentation to the Board in February/March. 2.3 The draft budget for the current year is prepared by the Treasurer in collaboration with the President and the Secretary-General. Committee Chairs submit any requests for funding, including project proposals and budgets, to the Secretariat for decision based on the Board’s priorities and the available funds for that financial year. The draft budget is presented by the Secretariat to the Board for outline approval in March February/March. The final budget is presented to the Board and the General Assembly, in turn, at the Annual Congress. The Annual Financial Report, the draft annual budget for the current year and a draft budget for the following year are submitted to the members one month before the date of the General Assembly. 3.1 To make payments and transactions for all AICA accounts within the budget and with the written approval by email of the Treasurer and/or the Secretary-General and to keep a written account of expenditure. 3.2 To make cheque and cash payments and payments with the AICA bank debit card up to 2,000 euros and to keep a written account of expenditure. Payments over 2,000 euros must have the written approval by email of the Treasurer and/or the Secretary-General. 3.3 To issue the bank orders for salary payments and payments to freelance employees on receipt of the valid pay sheets from the Accountants and invoices and to keep a written account of expenditure. 3.4 To make cheque and cash payments and payments with the AICA bank debit card for up to 2,000 euros and to keep a written account of expenditure. Payments over 2,000 euros must have the approval in writing of the President and the Treasurer. 3.6 To make payments with the AICA bank debit card and cash payments against receipts up to 300 euros. Expenditure over 300 euros must be made against invoices and authorised by email by the President and the Treasurer. Invoices must be issued against all payments received. All payments made and received must be recorded and reported monthly to the Treasurer. Cash must be kept securely. 3.7 To make payments up to 100 euros against receipts and, with the authorisation of the President and the Treasurer, to make transactions under the budget heading for Administration, up to 5,000 euros. All transactions must be recorded and reported monthly to the Treasurer. 3.8 The Administrative Assistant is responsible for filing all financial documents: invoices, receipts, copies of monthly bank statements and all written authorisations on paper or by email under the budget cost centres of income or expenditure. All financial documents, including authorisations, should be available for inspection by the Secretariat and/or by the Finance Committee at any time, on request, see Statutes Article 14. The Administrative Assistant, in consultation with the Treasurer, is responsible for submitting them to the Accountants at the appropriate time. 3.9 The Administrative Assistant checks the balance of fee payments received against the stamps sent to each Section and not returned, sends invoices to the National Sections and Open Section members in good time before the end of the calendar year and monitors each payment credited in the AICA current euro or US dollar account. S/he sends the receipts, updates regularly a Table of Subscription Payments and sends a copy to the Treasurer and in June reviews all the payments made and makes a list of the Sections or members who have not yet paid. The Administrative Assistant issues warnings to all Sections and members of the Open Section who have not paid their subscriptions for the second year in succession, that they risk suspension from the Association, if they fail to make payment, in full, within 28 days. See Articles VIII.2 and XII.2, above and Statutes Article 2.12b. 4.1 The President and the Treasurer are each delegated to make transactions from the AICA bank accounts after the approval of either of them or of the Secretary-General. 4.2 The Secretariat and the Administrative Assistant are authorised to have electronic access to the bank accounts to monitor their movement. 5.1 The Treasurer and Deputy Treasurer, if any, have access to, and are responsible for, monitoring all elements of the book-keeping, with the full co-operation of the Administrative Assistant and all internal or external accounting staff. 5.2 The Finance Committee is responsible for monitoring AICA’s financial accounts and is authorised to have access to the books, the management accounts and audited accounts at any time, on request. The Committee receives the Treasurer’s Annual Financial Report and the budgets for the current and following year and reports to the Board and the General Assembly. 6.1 Members of the Secretariat do not receive any payment for their work on behalf of AICA. They may only be reimbursed for the reasonable costs of travel, accommodation, telecommunications, office materials, official invitations, meals etc., against presentation of invoices for such costs, accompanied by the original receipts. 6.2 Each member of the Secretariat must have the approval in writing of the President and the Treasurer before engaging any new and not previously authorised expenditure in the draft annual budget on the Association’s behalf, amounting to more than 1% of the annual budget. If such an unauthorised expenditure regards the President and/or the Treasurer, the authorisation must be signed by two other members of the Secretariat or by one member of the Secretariat and the Chair of the Finance Committee. No member of the Secretariat shall reimburse her/himself without submitting invoices and receipts to the Paris office. 6.3 Secretariat members’ expenses for attending meetings of the Board, General Assembly, Secretariat or Committees in Paris or elsewhere, are reimbursed against invoices and receipts on the basis of an economy class plane ticket or standard-class road or rail travel, economy hotel accommodation and a per diem of up to 100€, paid against receipts, to cover miscellaneous expenses, including transport and meals, that are not covered by the hosts. 6.4 Secretariat expenses for the Congress have to be covered by the Host Sections as paragraph 1.1 above. Any request for financial support from AICA International must be agreed by the Finance Committee and the Board. 6.5 Expenses for any other meetings at which the presence of the Secretariat, or of one of its members, is required, are to be reimbursed, as in paragraph 6.2 above. The hotel and per diem allowance may be adjusted with the advance approval in writing of the other members of the Secretariat. No member of the Secretariat shall reimburse her-himself without submitting invoices and receipts to the Association’s office. 2.4 Persons wishing to exercise their right to deny access to any of this information, under Article 34 of Law no. 78-17 of 6 January 1978, are advised to contact the AICA Office at 32 rue Yves Toudic, 75010 Paris or to use its email address: aica.office@gmail.com. Individual members are entitled to prevent information about themselves from being posted on the website and must be informed of this entitlement by a standard letter from the President of their National Section or of the Open Section. Individuals using the website are also, in any case, informed of their rights, by means of inserts into the main page of the website and into all pages including this information.